The Mazda CX-3 is a compact crossover SUV that offers an incredible list of qualities which is why it has become a huge hit with drivers all over the world. With outstanding versatility and capability as well as roomy passenger and cargo space, it’s easy to understand why it’s become such a big hit with shoppers. The best thing about the new 2019 Mazda CX-3 is that it also offers an amazing list of standard and available safety features that help give it a top rating for passenger protection. Helping to give the new 2019 Mazda CX-3 a top safety rating is a long list of standard and available safety features. 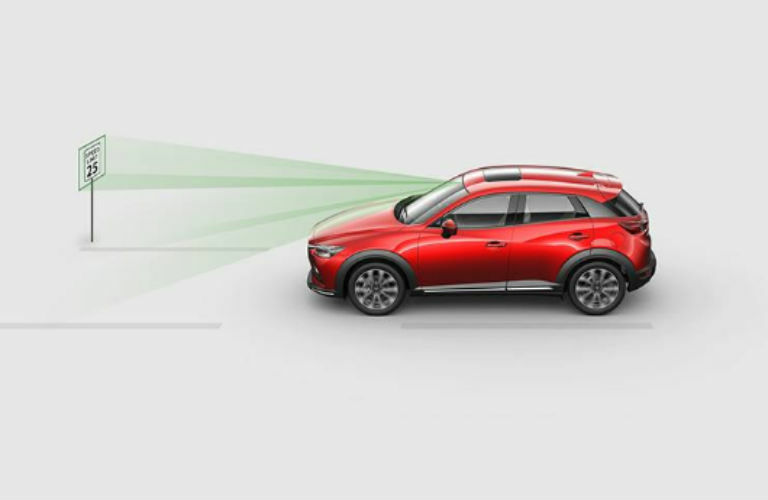 Right from the start, the 2019 Mazda CX-3 protects passengers with the available suite of i-ACTIVSENSE® features and technologies that can help alert you to potential hazards and even collisions. These available active safety features include High Beam Control, Rear Cross Traffic Alert, Lane Departure Warning, Adaptive Front-Lighting, Blind Spot Monitoring, Smart City Brake Support with Pedestrian Detection, Smart Brake Support with Collision Warning, Mazda Radar Cruise Control with Stop & Go, and a Traffic Sign Recognition System. Other safety features you can get in your new 2019 Mazda CX-3 that can help keep you safe on the road include an Active Head-Up Driving Display, and Mazda’s available i-ACTIV AWD® system that helps stabilize and improve overall traction when driving on slick road surfaces. The incredible list of standard and available safety features offered in the 2019 Mazda CX-3 also include advanced front airbags, a rearview camera system, an anti-lock braking system (ABS), side-impact airbags, Dynamic Stability Control (DSC), a Traction Control System (TCS), hill launch assist, tire pressure monitoring system (TPMS), child safety rear door locks and many others that help you stay safe. This entry was posted on Thursday, October 11th, 2018 at 2:51 pm	and is filed under Mazda CX-3, Safety, Technology. You can follow any responses to this entry through the RSS 2.0 feed. You can skip to the end and leave a response. Pinging is currently not allowed.